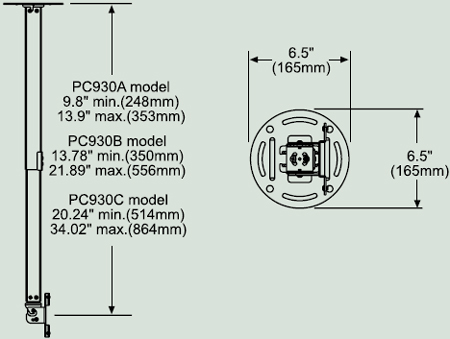 Dimensional Diagram for PC-930A Paramount ceiling Mount for 15"- 24"
The ceiling is a great place to mount a flat panel when there is no wall available. 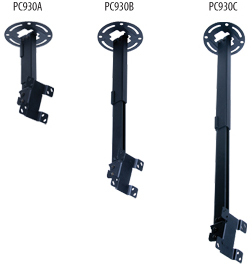 Ceiling installation is made simple with PC930s one, two, three design. 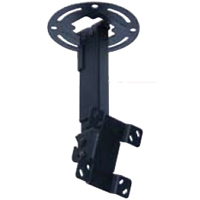 Simply attach the ceiling plate, attach the adapter to the screen and hook-on the TV on to the mount. This VESA compliant LCD mount delivers the ultimate in positioning options with its tilt and infinite swivel to achieve an ideal flat panel viewing experience.